With their latest Instant Translate (Mate) update, the team introduces a new cool Phrasebook feature. They put together a lot of customer requests and came up with the brilliant Phrasebook functionality. Creating and organizing your vocabulary has never been easier. Basically, Instant Translate's Phrasebook is a good old paper phrasebook brought onto your Mac with amazing text-to-speech function, search, and unlimited offline storage. Another advantage is that you are able to compose wordlists on your own with words you need without being bound to a fixed set of phrases. You have 103 languages at your disposal. Some of you who are using Instant Translate on iOS or Android, are already familiar with the Phrasebook because this feature appeared a bit earlier there. Instant Translate developers have had an ability to get a few experience reports from their users on these platforms. For example, Martin (24, Vienna) who is working at a refugee center Train of Hope steadily needs a bunch of basic phrases in Syrian because not all refugees speak English or German, so he uses Instant Translate's Phrasebook with the text-to-speech function to ease his communication with people he faces every day. Or, Anna (31, Moscow), who is a photojournalist and a frequent traveler in the line of duty, often goes to countries where English is not considered la Lingua franca, so she takes advantage of our Phrasebook to save the most important phrases, such as ordering food, booking accommodations etc. And she finds it very convenient that all the words are available offline, since it can be vital while being abroad without the Internet connection. That’s it. Yes, it’s really that easy. Besides the amazing new functionality, Instant Translate has its old features remastered. This version has a more contrast and lightweight interface, which is easier to interact with. What’s next? 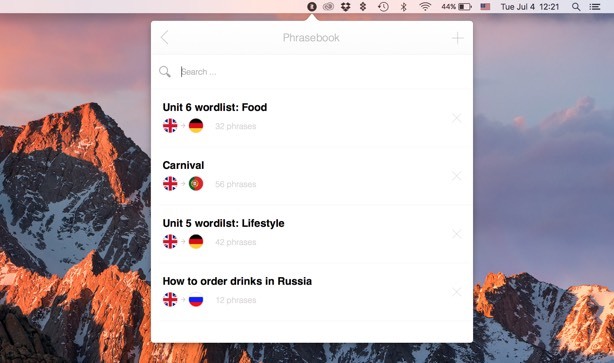 Synchronization and share possibilities for Phrasebook and history across all devices. This will turn Instant Translate (Mate) into an ultimate translation ecosystem. By the way, don't be surprised if you don't find Instant Translate in the list of your apps one day. We are changing the name. A lot of interesting updates are coming soon, stay tuned!